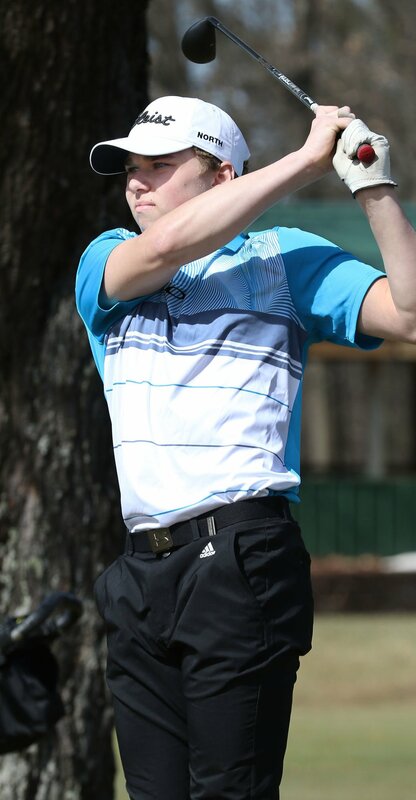 Memorial's Billy Peterson hit his tee shot on hole No. 15 at Hallie Golf on Tuesday. View more photos at LeaderTelegramPhotos.com. 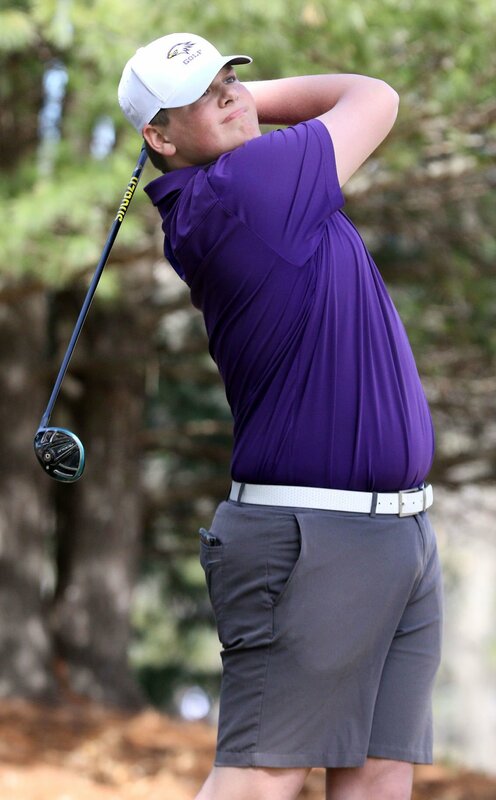 North's Caden Sutter hit his tee shot on #10 at Hallie Golf on April 16, 2019. View more photos at LeaderTelegramPhotos.com. Peterson led the Old Abes out of the two spot, shooting a 40 on the back nine. He birdied the 12th, but shot four over on 13 and bogeyed 14 to set him back. In the end, Memorial finished the day shooting a 164, good for third behind Hudson and River Falls respectively. Peterson said he is optimistic his team will turn it around as they continue to work off their winter rust and grow more confident in their swings. Hudson’s Bennett Swavely took first in the tournament, shooting a 37. He was followed with a three-way tie for second that included River Fall’s Maxamillian Xiong, Charley Chase of Hudson, and Rice Lake’s Blake Zadra. If not for his final hole, Zadra would have finished first. He entered the hole shooting just one over, with just a bogey on 13. The Warriors — who finished fourth on the day — played without Simon Cuskey, Sam Johnson, Tyson Tomesh and Braeden Resnick, all of whom are expected to be key contributors for Rice Lake this year. Xiong looked strong in his first tournament of his sophomore year. Last season he was named second team all-conference while dealing with an undiagnosed case of tendinitis in his right wrist. This year, he said he is healthy and hoping to improve on a tremendous freshman year. Xiong sliced his tee shot on 18 into the trees, but was able to navigate his back swing around a tree that brushed up against his back to punch out back onto the fairway. A nice chip shot allowed him to put in from a few feet out to score a birdie. Chase Gould led Eau Claire North, shooting a 47 from the four spot, Chippewa Falls’ Alex Nelson led the Cardinals with a 40 in their top spot, and sophomore Grant Imsande was the top scorer for Menomonie with a 42 in their one spot. Barring weather, Big Rivers’ next conference tournament is on Thursday at Meadow Valley Golf Course-Black Wolf Run. Hudson 157, River Falls 161, Memorial 164, Rice Lake, 177, Chippewa Falls 195, North 195. 1, Bennett Swavely (HUD), 37; 2, Charley Chase (HUD) 38; 2, Maxamillian Xiong (RF) 36; 2, Blake Zadra (RL) 38; 5, Taylor Rotsaert (RF) 39; 6, Billy Peterson (ECM) 40. Memorial: Zach Bernhardt 43, Max Savaloja 41, Tommy Nordlund 41, Liam Sather 42. North: Caden Sutter 48, Dylan Kierstead 51, Nick Owens 49, Chase Gould 47, Carter Fridlund 55. Chippewa Falls: Alex Nelson 40, Brett Elkin 56, Ian Olson 47, Collin Albright 48, Aiden McCauley 50. Rice Lake: Mason Nolin 45, Bryce Brettingen 52, Joey Schmitz 47, Carter Root 47. Menomonie: Grant Imsande 42, Michael Maguire 44, Zachary Foslid 48, Brody Thomson 53, Conner Rose 53.